When you make money, we make money! The Twisted Thread is North Atlanta's #1 upscale consignment store for one simple reason: We simply have the best consigners in Atlanta, and we love it when our consigners get paid! Consign with us in 3 easy ways: Your Choice! For Drop Offs simply come in, drop off, and sign for your items! We'll lovingly sort, valuate, and merchandise every sellable item, plus donate the rest. Make an Appointment if you'd like to personally review your items with us, and take anything back not selected for sale. House Calls are a valet-style service where we will COME TO YOU, review your private inventory, and crate-back to the store for priority entering. Glass of prosecco champagne while in-store upon request! Prada . Gucci . Tory Burch . Chanel . Coach . Chloe . Louis Vuitton . Christian Louboutin . Versace . MCM Miu Miu . Free People . Helmut Lang . Vince . Hermes . Johnny Was . White House Black Market . Escada. Diane Von Furstenberg . Athleta . Lulu Lemon . Elizabeth & James . St. John . Paige . Joe's Jeans . Hudson . Lilly . Olivia Moon . Tibi . Citizens of Humanity . Rachel & Zoe . Nanette Lepore . True Religion . Vince . Trina Turk . Theory . Manolo Blahnik . Jimmy Choo . BCBG . DKNY . H&M . Zara . Burberry . Anthropologie . 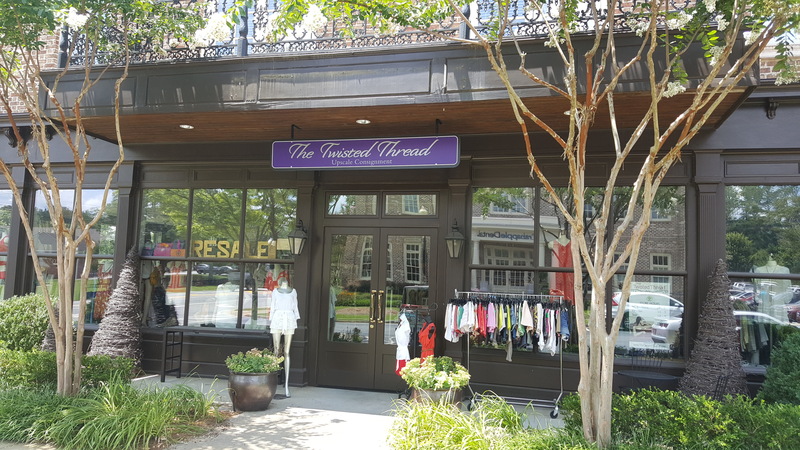 The Twisted Thread is North Atlanta's #1 upscale ladies' consignment store! Our beautiful 1800 sq. foot retail storefront is in the heart of Crabapple's "boutique district" just 3 doors down from The Old Blind Dog tavern.